Jennifer Lee and her four year-old daughter Kristin check out the Halloween candy she brought home from school. "Arlin was so sad that he couldn't go trick-or-treating that I promised him we wouldn't go either", reminded Lee to her daughter. "No, he couldn't go, because he was in the hospital, right?" 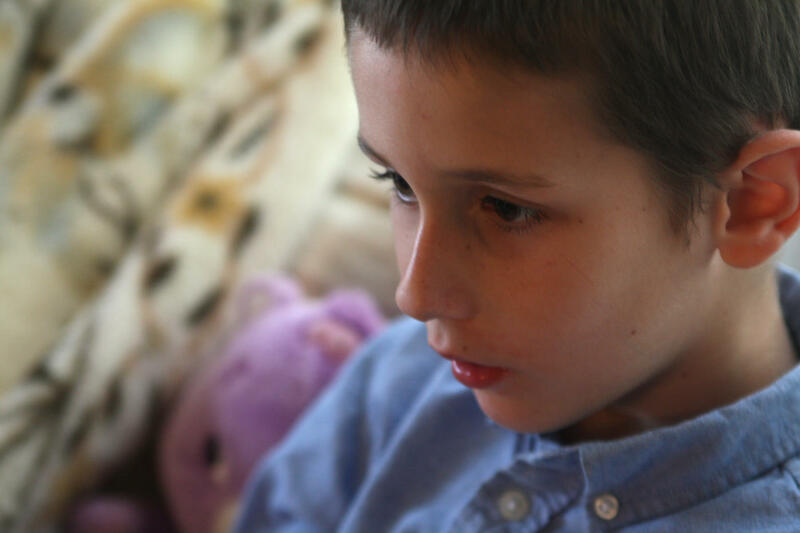 Lee's seven-year-old son Arlin has been in a behavioral hospital in Orlando for almost two weeks. He lives with bipolar disorder and had reached a crisis point. The single mom drove her son three hours away from their Cape Coral home to get help. “He was very manic and out of control either laying on the floor upside down or running around like crazy – sticking his head in the garbage can and laughing.” recalled Lee. According to the National Institutes of Health, about one in four adults in America lives with a mental illness. Many of the symptoms start early in life. But seeking treatment for kids can be a long struggle for parents – especially in Florida. Studies show the state ranks 49th in the country for its per capita spending on mental health services. Lee said Arlin’s condition didn’t go from zero to sixty overnight. “There were some red flags pretty early on, but at age four is when I actually started searching for help,” she said. A play therapist in Fort Myers, a doctor in Okeechobee, a psychologist in Bradenton… and her list goes on. Lee searched for providers who took her insurance. Despite therapy and different medications, many of his symptoms continued with little relief. “By the time I see children and families, they’ve been through several evaluations,” said Dr. Omar Rieche, a child and adolescent psychiatrist in Fort Myers. He said kids living with severe mental illnesses often reach a crisis point before getting the help they need. “The situation may continue until there is an incident in the school or there’s an altercation or a fight – the child may state they want to kill themselves,” said Rieche. Which is what happened to Arlin at age six. Last month, he was admitted into the local inpatient crisis center twice in two weeks, because he was deemed a threat to himself. “It hurt so bad the first day I visited him and had to leave,” said Lee. Lee felt like there was no other way to get the help her son needed in Southwest Florida. “Basically what’s available around here are outpatient psychiatrists or the inpatient crisis thing. It seems like there’s nothing in between,” she said. It was after he was released the second time from the crisis unit that Lee took him to the hospital in Orlando. “Everybody’s like, ‘He’s in the hospital? What for? Did he break a bone?’ And you’re like, ‘I kind of wish he had, rather than this.’ Because you would know that it could heal,” she said. But Lee is not alone in her struggle. According to a report by the Commonwealth Fund, only half of kids in Florida receive the mental health services they need. “If I was Joe Citizen, I think I would be absolutely shocked by that number,” said Norín Dollard, an Assistant Professor in the Department of Child and Family Studies at the University of South Florida. However, Dollard said the issue is not only a lack of funding. “There’s just not enough appropriate slots for kids either,” she said. Parents like Jennifer Lee find themselves driving hours away from home to get help, which only adds stress to the situation. “If it could be in Lee County and I could make every visitation time that he has, it would be awesome. I could actually go meet with the doctor and therapist. I don’t have that option here really,” said Lee. After two weeks in an Orlando behavioral hospital, Arlin returned home. He runs around the house pretending to be cops with his younger sister Kristen. Lee said her son in on different medications now and seems to be more stable. She was able to make a follow-up appointment with a local psychiatrist. However, she said that a once a week visit may not be enough. “The search continues,” she said. But Lee knows she’s not out of options yet and is willing to make the drive if that’s what it takes to help her son.